Frozen tissue array is a method used in clinical research to analyze several cell samples on a single slide. Hundreds of tissue cores are stacked in a specific arrangement that allows simultaneous histological analysis. This method significantly saves time during research as it is easy to streamline several cell studies at once. It is an effective screening tool that is used to study and preserve tissue samples on a single slide. Scientists who develop vaccines and drugs need to get their preliminary results from frozen tissues before their drugs are approved. This technique comes in handy as the best tool for data analysis in medical research. Advancement in molecular biology in our time led to the discovery of thousands of new genes and RNAs. This gave birth to the need for a methodology that could help compare and analyze several tissue samples on one slide in a timely and cost-effective manner. These arrays are produced using fresh tissues and state-of-the-art preparation techniques. The tissues are placed in liquid nitrogen and accurately assembled by an expert pathologist. Tissue cores with the same features are combined in a single block. Specimens: Frozen tissue arrays may carry tissues of different specimens including cells, cell lines, and tissues. In a frozen array, the embedding medium of choice is Optimal Cutting Temperature (OTC). As opposed to paraffin tissue array, frozen tissue sections don’t undergo any fixation procedures. The DNA, RNA, and protein in frozen tissue arrays retain their original characteristics, making it the most reliable technique for medical research. Frozen tissue cores with 2 mm diameter from the regions of interest are removed from the OTC block at different freezing temperatures. All the tissue cores are then injected into an OTC frozen block that is spaced in an array pattern. Read more on the topic here. Frozen tissue samples are used in immunohistochemistry and translational research. The frozen tissue arrays are used to ascertain the clinical relevance of biological targets during the making of drugs, vaccines, and diagnostic reagents. The frozen tissue samples also come in handy in the study of protein markers and genes. Frozen tissue arrays contain proteins and RNA and DNA molecules, and for that reasons, they provide a solid background for analysis of molecular markers. This might help doctors to map and conclude what disease or condition a patient might have, and pathologists to determine causes of death. Adhere hence to guidelines: For frozen tissue arraysto be useful in the background of medical research and development, frozen tissue arrays need to be designed in strict adherence to medical guidelines. For laboratories to develop frozen tissue arrays, they have to meet stipulations of therapeutic antibody validation and vitro diagnostic device certification. Broad range of tissues: A frozen tissue array should offer a broad basis for study and comparison. For this reason, an array should have samples from different specimens. Better exposure: Frozen tissue arrays are maintained at a temperature -70 C. Because of that they offer a better antigen exposure during tests in research. No pre-fixation: RNA, DNA and protein molecules don’t perform optimally when used in a pre-fixed tissue sample. The OTC method of creating frozen tissue arrays ensures that performance of the cell molecules is not affected. Procedures that need fixation can be identified and done in a moderate manner. Wide array of samples: With the frozen array, it is possible to include a wide array of samples in your analysis than when using the paraffin tissue arrays. For humans, a single frozen tissue array can include 50 different human tissue types with several donors per tissue type. Less labor and cost effective: Frozen array enables comprehensive validation of antibodies across 50 tissues simultaneously. There is minimum labor and cost needed for this job, and accurate data can be obtained about expression pattern, intensity, and distribution of target proteins. Frozen tissue array can therefore be used for large-scale analysis of genetic alterations in situ hybridization or immunohistochemistry on hundreds of tumor specimens at the same time. Preserves the integrity of samples: Frozen array improves conservation of tissue resources and experimental reagents. A certain degree of cell morphology and tissue architecture distortion occurs during fixation in paraffin tissue arrays. This is not the case with frozen tissue samples, which provide an accurate analysis of molecular markers associated with disease diagnosis, prognosis, and therapeutics in patients. The method of removal in frozen tissue arrays ensures that there is no distortion and disruption of tissue features. Gliomas: Frozen array offers a powerful strategy for rapid identification and thorough characterization of differentially expressed genes in Gliomas. A breast tumour: Frozen tissue arrays are effective in pointing out genes that are overexpressed in the MCF-7 breast cancer cell line when samples are compared with normal mammary tissue. Renal Cancer: Array analysis on 532 renal cell carcinomas can be studied in comparison to normal kidney tissue. The data is used to determine vimentin expression in immunohistochemistry. 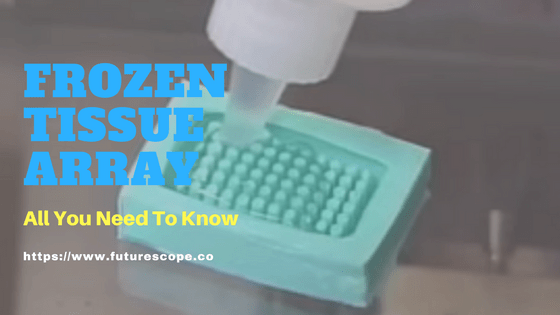 Frozen tissue array is an invention that has truly revolutionized medical research, making it possible to quickly obtain accurate data in the development of therapy and diagnostics.